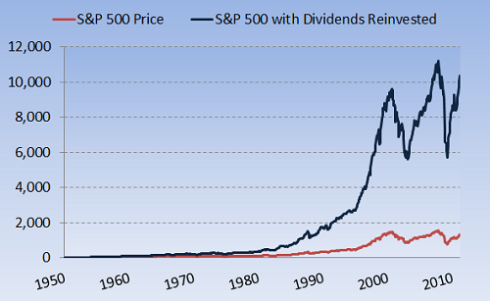 Dividends are the surest way to enjoy the financial benefits of ownership. A few months ago, I wrote about why going public isn't all it's cracked up to be. In explaining my reasoning, I mentioned: "Many people think that when they buy a company's shares, they're actually giving money to the company. Unless you're participating in the initial (or secondary) public offering of a company, the money is just going to the person who's selling you the stock." A day later, I got an email from a reader asking me to explain this. To give a real-world perspective on this, I told him to think about someone -- let's call him Mike -- who is buying a used Ford. When Nancy offers to sell her car to Mike, Mike pays Nancy. Ford doesn't see any of the cash from that transaction. Ford got the money when a dealership paid for it (akin to an initial public offering). The difference between buying a stock from someone and buying a car from someone is that you can use the car to do lots of different stuff while you own it. The stock share itself doesn't have much daily utility, despite the fact that you're legally a part owner of the company you hold. In fact, aside from voting on company issues -- which is important -- all you can really do is wait until a later time and sell the stock to someone else. Of course, it's a little more complicated than that, but to many people, this realization makes owning stocks seem pointless and silly. There is, however, a distinct exception to this "wait and sell" approach: dividends. Unlike shareholders of companies that don't give regular payouts, shareholders of dividend-paying companies not only get to vote on company issues, but they also get steady payments from the companies they own. If you pay $10 for a share of a stock that has a $0.40 dividend payment -- or a 4% yield -- that stays the same for the next 25 years, the company will have fully reimbursed you for your share, and whatever you sell it for will be pure profit. That's not a bad deal. The even better news is that there are some companies out there that consistently raise their dividend and only use a healthy amount of earnings to make these payments each year. Below are five companies most of you should be familiar with, some of which have a record of increasing dividends. Of course, some of these stocks appear to be better deals right now than others. Some may argue that Disney isn't much of a dividend stock, given its relatively low payout ratio and scant history of increases. But as the company's growth curtails, it will be able to devote more of its earnings toward paying dividends. As it stands, Disney only uses 20% of its profit for dividends right now anyway. Coke and 3M, it could also be argued, seem to be trading for pretty high prices right now: Both companies have seen their share prices rise by more than 15% over the past year. That would leave Procter & Gamble and Johnson & Johnson as prime candidates for any dividend investor's portfolio. But for the long-term investors (we're talking decades here, Fools), each of these five stocks represents a solid opportunity to share in the profits made by big American companies. I already own Coke and Johnson & Johnson, and I have bullish CAPScalls on my All-Star Profile for them. If you'd like to know which three Dow stocks our top analysts think offer the best long-term rewards, check out our special free report: "The 3 Dow Stocks Dividend Investors Need." Inside, you'll get an even more in-depth look at the best dividend opportunities available. Get your copy of the report today, absolutely free!